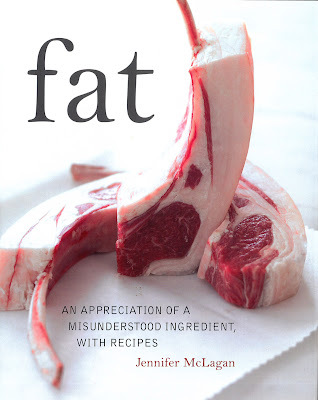 I'm not sure that Jennifer McLagan did herself any favours by naming her cook book, 'Fat'! It's not the most appealing of book titles and those chops featured on the front don't really do justice to the variety of recipes in the book, which is actually really very good. Whilst, these days, we may know everything about olive oil, we’re less aware of how to use lard and bone marrow. 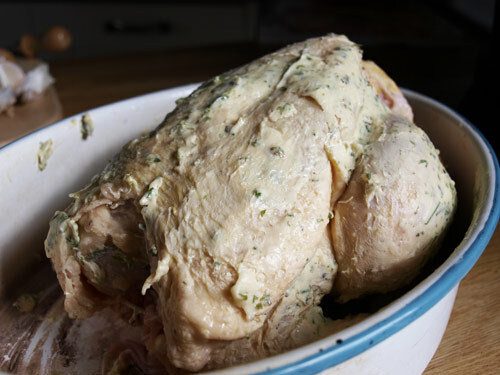 Jennifer McLagan offers extensive guidance on sourcing, rendering, flavouring, using and storing animal fats, whether bacon, schmaltz or suet. Stories, lore, quotations and tips round out this rich and unapologetic celebration of food at its very best. Bring a large saucepan of salted water to a boil over high heat. Add the spaghetti (I didn't have any so used tagliatelle), stir, and return to a boil. Adjust the heat so the water boils gently and cook until the spaghetti is al dente, 10-12 minutes. Drain well. While the spaghetti is cooking, cut the butter into pieces and place them in a large frying pan over medium-low heat. 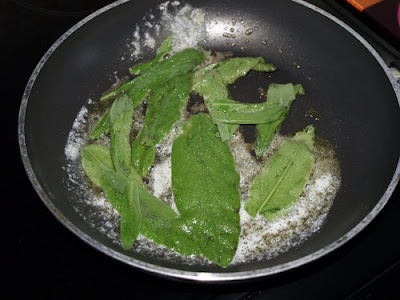 When the butter is melted, add the sage leaves and cook, turning once, until the leaves are crisp and the butter begins to brown, about 7 minutes. Add the cooked drained spaghetti to the frying pan and toss to coat with the sage butter sauce. Season well with salt and pepper and serve immediately. For such a simple dish, this was absolutely delicious and made a quick and easy supper for me after my yoga class this week. Pork Fat - The King! Pre-heat the oven to 230C. Pat the chicken dry, fold the neck flap under the bird, and secure it in place using the wings. 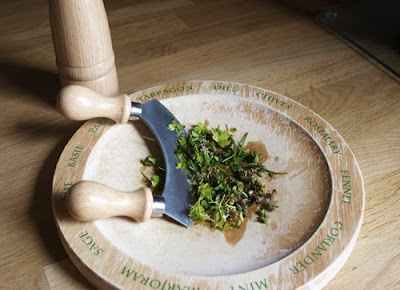 Set aside a few herb sprigs and chop the remainder; you should have about 1/2 cup. Using your hands, mix the chopped herbs and garlic into the butter until blended. Smear the herb butter all over the bird, placing a little inside the bird, too. Season the bird well with salt and pepper. Place the bird in a roasting pan and squeeze the lemon juice over the top. Put the lemon juice over the top. Put the lemon halves in the bird's cavity with the reserved herb sprigs. Roast the chicken for 15 minutes. 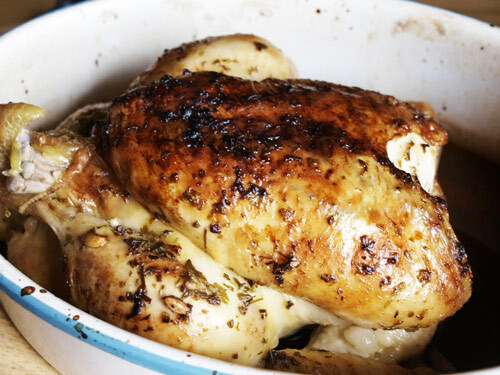 Remove from the oven and baste the chicken with it's own juices. Reduce the heat to 375F and continue to roast, basting occasionally, until the thigh juices run clear when pieced with a skewer or the temperature of the thigh registers 165F on on a kitchen thermometer, 45 - 55 minutes. Turn off the oven, open the oven door, and leave the chicken in the pan in the oven to rest for at least 15 minutes. Transfer the chicken to a chopping board and cut into serving pieces. Add any juices from the chicken to the pan and place the pan over medium heat. Bring to a boil, deglaze the pan, using a wooden spoon to scrape up the browned bits from the bottom, then strain through a fine-mesh sieve and serve the pan sauce with the chicken. I pushed some of the herb butter up under the skin of the chicken as well as over the skin. It certainly kept the chicken moist and the sauce was really flavoursome. Recipes include: Roast Beef with All the Trimmings, Suet Pastry, Bone Marrow in Red Wine Butter Sauce, Cape Malay Lamb Shoulder. I would certainly recommend this book, there are loads of interesting facts about the different types of fat as well as a range of recipes for all tastes. Disclosure Statement: I received a copy of 'Fat' by Jennifer McLagan for review. I was not required to write a positive review. The opinions I have expressed are my own. The prices are correct at time of posting. I am Jack Sprat's wife - I think I need this book! Thanks Janice, Book Depository here I come! I like the name of this book. After all to me fat equals flavour. Particularly if it's good fat and not low cal spread or diet coke! I often make this sage butter sauce with pumpkin ravioli.....delicious! Sounds like a good book! Definitely a topic worth talking about. Lucy - it's definitely the book for you then! Laura- you are so right, although I did baulk at some of the recipes, I would happily make and eat the majority. ATIE - indeed it is. Love the approach she has taken, while the cover doesn't exactly make me drool the content sounds really useful. 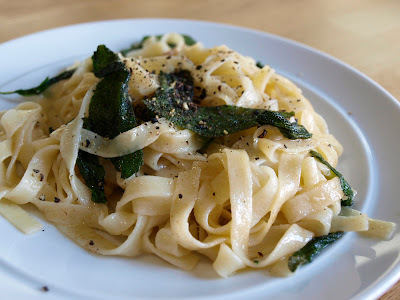 I love crispy fried sage with pasta dishes. Delicious. My copy arrived a few days ago. Looking forward to getting stuck in. MY copy of Fat just arrived Janice, and brought gasps of horror from my vegetarian parents when I showed it to them! LOL! Like you I am not sure about the title and photo on the front of the book, but I think it was dine deliberately to provoke and cause debate....but, again like you, I am VERY impressed with the recipes in the book and I am going to make the butter chicken I think! GREAT review and lovely recipe! This book looks really interesting from your descriptions but I think you're right - I doubt I would have picked it off the shelf from the title/cover.